What if the figure that haunted your nightmares as child, the myth of the man in the woods, was real? "He'll slice your flesh, Your bones he'll keep." Twenty years ago, four teenagers went exploring in the local woods, trying to find to the supposed home of The Bone Keeper. Only three returned. Now, a woman is found wandering the streets of Liverpool, horrifically injured, claiming to have fled the Bone Keeper. Investigating officer DC Louise Henderson must convince sceptical colleagues that this urban myth might be flesh and blood. But when a body is unearthed in the woodland the woman has fled from, the case takes on a much darker tone. The disappeared have been found. And their killer is watching every move the police make. Liverpool crime writer Luca Veste takes a step away from his really good DI Murphy and DS Rossi series with this creepy standalone, which melds local mythology and 'boogieman' stories with a dark and twisted contemporary police procedural. Murphy and Rossi may be offstage in this one, but many of the things I love about that series are present here too: smooth writing, twisted plotlines, a page-turning pace and narrative drive, and the way Veste paddles in the darker end of the crime pool without ever floundering into gratuitousness or drowning in eye-roll moments (as lesser authors do). I'd heard about this book a long time ago, because I'd won a charity auction a couple of years back to name a character in one of Veste's future tales. You may recognise my surname in one of the supporting characters, though it's not me but instead my crime novel-loving father who I chose to honour with the reference. So keep an eye out for DCI Peter Sisterson. 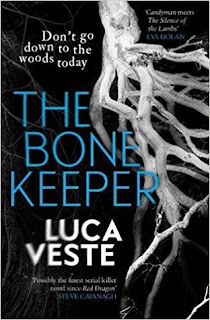 Consequently, I had a high degree of anticipation for THE BONE KEEPER, with the accompanying anxiety that it might fall short of my high expectations. Fortunately, that wasn't the case. It's a really good read. DC Louise Henderson and DS Paul Shipley of the Merseyside Police turn up on the scene after a woman collapses on the street, badly beaten and sliced up. They assume it's the terrible aftermath of just another domestic assault, horrid and common, but the woman is babbling about escaping from the clutches of the Bone Keeper, a local urban legend immortalised in a creepy children's rhyme. He’ll slice your flesh,Your bones he’ll keep.The Bone Keeper’s coming,And he’ll make you weep. Surely it's just the ravings of a badly abused woman. But what if it's not? Henderson and Slater have their doubts, but the urban legend snags at communal fears. As the police comb wooded areas of the city, they begin to wonder just what horrors they'll find. Man or myth? When a body is discovered and more murders occur, it's clear someone is using the Bone Keeper as a mask for their own purposes. Or has the urban legend been true all along? Veste does a terrific job beckoning readers into the dank, tangled recesses of his city. He sets the scene brilliantly, with descriptions that goosebump your flesh and leave a sense of something menacing lurking just off-screen. At the same time there's a gritty authenticity to THE BONE KEEPER - it's crime that veers towards horror without ever feeling fantastical. Dark but realistic. And that can be even scarier. The characters in THE BONE KEEPER are fascinating. DC Louise Henderson keeps a lot of secrets, from her colleagues and readers, and this draws us in in some ways while also keeping her somewhat at arms length in others. She's a volatile loner with a troubled past, and not particularly likable. But she is interesting. Shipley is the straighter man to her unorthodox maverick, and there's an intriguing tension in their interplay and relationship, something that feels relatively fresh and atypical. This is a clever, dark and twisted read that keeps you gripped from start to finish. If I was to use Hollywood tagline parlance, think Mark Billingham meets The Blair Witch Project.